La politica es la politica will post monthly English language translations sourced from the Americas Mexico Blog. 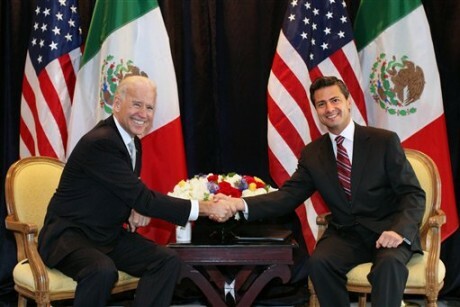 La Jornada: PRI presidential candidate, Enrique Peña Nieto, said after his meeting with U.S. Vice President Joe Biden, ....(that) one of the points on which (he) made ​​the greatest emphasis was security, and that he made with Biden "the clear commitment (in case he wins the presidency) to combat organized crime, working in a close and productive collaboration that allows us to deliver results in this area. It is a task and an obligation of the State to do it head on and create conditions of security. And of course we talked about that, to date, the results are poor." .... At a press conference after the dialogue, the former governor of the state of Mexico said he made ​​it very clear to the Vice President's that "my personal position and that of my party, counter to various speculations that have been made, is that there is an unavoidable task of the Mexican State to combat organized crime more effectively, and that the discussion is not focused on whether or not to fight, but how to achieve better results." Peña Nieto, who attended the meeting with Biden accompanied by the PRI's national president, Pedro Joaquin Coldwell, and his campaign manager, Luis Videgaray, said that another of the points discussed was the challenge of Mexico's economic growth and creating jobs . He also spoke of the desirability for both governments, "in the near future of the two administrations, to broaden the relationship between the two countries for greater benefits for our peoples, the opportunity to explore, to go beyond what has been until now a bilateral relationship in commercial terms." Milenio: Enrique Peña Nieto finished his meeting with U.S. Vice President Joseph Biden emphasizing the importance of coordinating actions for economic growth in Mexico and the intention to continue the fight against insecurity, but with another strategy. At the end of the meeting, the PRI candidate presented to the American his interest in improving the country's economic growth that so far has had poor results, since he considers this also to be a tool to reduce the lack of security. As regards the fight against crime, he reiterated that it is an unwavering commitment and the discussion is not whether or not to fight but how to achieve better results. He noted that the change in administrations in both governments that will be almost simultaneous opens the opportunity to broaden the relationship and the benefits to go further in terms of trade. Regarding the statement by the vice president, he agreed with Andres Manuel Lopez Obrador that the U.S. government has committed itself to respect the vote of Mexicans and there will be no favoritism toward any candidate. The PRI presidential nominee welcomed Biden's position on the presidential succession in Mexico. "First, he let us know that he had absolute respect for the democratic process that Mexico is living through. Second, his commitment to work with and respect whoever wins this election." He affirmed that he also shared with Biden his energy project, which includes the probable opening of Petróleos Mexicanos and the necessity in the next six years to look for migration reform. La politica es la politica has reported on a recent poll that suggests the PAN’s presidential candidate Josefina Vázquez Mota had significantly closed the gap with Enrique Peña Nieto of the PRI. Many thought that poll was too optimistic and, as the NYTimes.com reports, below, they may be right. NYTimes.com: Enrique Peña Nieto of the Institutional Revolutionary Party (known as PRI) holds a commanding lead over his nearest rival four months ahead of presidential elections. A survey by the pollster BGC,showed Mr. Peña Nieto with 47 percent, followed by Josefina Vázquez Mota of President Felipe Calderón’s National Action Party (or PAN) with 29 percent. BGC said it polled 1,800 voters between Feb. 23 and Feb. 27 and that the results had a margin of error of 2.4 percentage points. La Jornada: A leader of the business community criticized the environment of insecurity in Mexico over the last six years as “regrettable” and called for a “better strategy” to combat organized crime that will guarantee Mexican citizens peace and tranquility as soon as possible. In his first press conference as president of the Mexican Business Confederation (Coparmex), Alberto Espinosa Desigaud said that due to the climbing violence, businesspeople have been exposed to robbery, kidnapping, extortion, and murder. “It is fundamentally a matter of government policy, and not just at the federal level,” he added. “If we only rely on the actions of the federal government to generate better results, then we are really on the wrong path,” remarked the Coparmex head who was elected on February 29th, replacing Gerardo Gutiérrez Candiani. Espinosa Desiguad acknowledged the pressures that municipal government officials are exposed to when it comes to confronting organized crime, but reaffirmed that they cannot continue to put aside what needs to be done. He also maintained that municipal level politicians need to do a better job of protecting themselves, along with the state and federal governments. Espinosa Desigaud also stated that the global economic turndown has had an impact on the levels of violence in Mexico. He claimed that if national economic growth were at 6 percent annually, and the required number of jobs were generated, that the bloodshed could decrease. Regarding the agenda that the business group will pursue following his swearing-in as president, Espinosa said that Coparmex will concentrate on promoting a quality education system for all Mexicans, supporting citizen participation in democratic processes, developing proposals to strengthen public security, and starting an action program to stimulate the economy. Finally, Espinosa Desiguad announced that all of the partners of the organization will take to the streets all around the country in order to promote informed voting, to help oversee the electoral process, and to demand that politicians comply with their promises. However, he emphasized that Coparmex is a non-partisan organization and will not endorse any single candidate or party, adding “we will be very quick to question all of the candidates about their concrete proposals for achieving the great changes that our country requires. La Jornada: Carlos Lauria, head of the Committee to Protect Journalists (CPJ) in America, demanded that President Felipe Calderon and senators "unthaw" the initiative he proposed that would make attacks on journalists a federal crime. He also asked the presidential candidates and political parties to include in their electoral agenda the issue of journalists. He noted that the president has failed in his objective of providing security to the profession of journalism, since the Special Prosecutor for the Prevention of Crimes against Freedom of Expression does not have sufficient structure and the manner in which it works is not adequate to dispense justice. "It is clear that the Calderon administration has failed. It knows, it is aware of what happens, but the response has been as ineffective as it is inefficient. 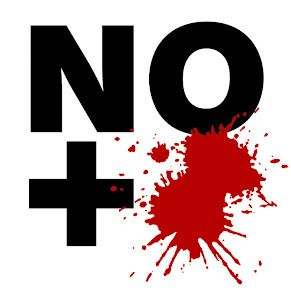 La Jornada: The president of the National Commission on Human Rights (CNDH), Raul Plascencia, said the increase in internal displacement caused by the violence generated by the fighting between criminal orgainizations and public safety forces "is a phenomenon that must be eradicated; since 2006 it adds up to tens of thousands of people in states such as Tamaulipas, Michoacan and Sinaloa , and in places like Ciudad Juárez there are almost 150,000. He stressed that there have been 20 thousand people displaced by violence in Chiapas since 1994. This phenomenon, the national ombudsman said, has to be documented and the violence that causes people to have to change residence within the country--or even to leave our borders--has to be prevented. Other displaced by violence, Plascencia Villanueva said, are people who flee from their nations, as is the case with Guatemala. La Jornada: The secretary general of the Organization of American States (OAS), José Miguel Insulza, said that "we need to try something else" in the fight against drugs that is being let loose on the continent, because "we are not close to winning" this war. "How many more things have to happen for this to end, how many more prisoners, what quantity of drugs should be confiscated?" he asked. He said it is necessary to seek other strategies that place greater emphasis on demand in the drug-consuming countries and on the attack on bank secrecy and hidden money flows. At the conference, "The Inter-American Order Faces the Challenges of Globalization: old and new actors in the world order," held at the Autonomous Metropolitan University of Xochimilco, Insulza pointed out: "We have many prisoners in the Americas resulting from the war against organized crime and we have also confiscated much wealth, but for some reason it doesn't appear that we may be having much success." He said that the drug war grabbed hold of President Nixon at the beginning of the decade of the 70's." And he asked if, after more than 40 years of this struggle, the outcome is a failure. "To use the word failure properly, one has to understand that in 2010, according to estimates by international agencies, nearly half the cocaine shipments in the world were seized, and of the 3,600,000 people throughout the Americans (outside the U.S.) who are in prison, one third is for drugs. "That is, more than 1,200,000 people in (Latin) America are locked up because of drugs...."